This Scratch Extensions Browser Plugin allows you to use LEGO WeDo 1.0, the PicoBoard and other serial or USB devices with the online version of Scratch. After it downloads, open the plugin file and follow the instructions on your computer to complete the installation. If the Scratch browser plugin was correctly installed, you should see a green or yellow status indicator in the "More Blocks" area. Green: You can start using your hardware device with Scratch. Red: There's a problem. Move your cursor over the status indicator to find out what's wrong. Important: The first time you add an extension, your browser may ask whether to allow the plugin to run. Make sure you choose "Allow and Remember" (or similar option) from the dropdown so your browser remembers your preferences. If you need to change Preferences later, look for the plugins dashboard in your browser (you can usually find it in the tools menu). Example: Be sure to choose "Allow and Remember" in Firefox (or similar option in other browsers) from the dropdown so that the browser will remember your preferences. Once you install this device plug-in, you can use any of the Scratch extension blocks. In Scratch, click on the "More Blocks" category and select the "Add an Extension" button. You can then select "LEGO WeDo" or any other extension, and the blocks will be added to the project. 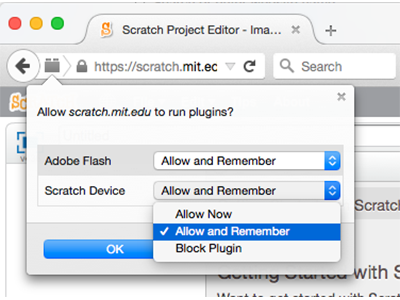 The Scratch extension plug-in currently works only on Mac OS X and Windows.